Who is creating the rotten barrels in your company? In an earlier post, I discussed the myth of the rogue employee. The post focused on how the term was used when an organisation wanted to scapegoat an employee. When that happened, I argued that the organisation used the term to avoid the work required to deal with systemic organisational failings. After I posted it, I was asked if a senior manager could be a “rogue employee”. At first, I thought it was unlikely because they would be unlikely to be scapegoated because of their relative corporate standing and most importantly they would be responsible so less likely to be a problem. From the perspective of the organisation, senior managers could be best placed to be a “rogue” employee. As they are senior, there would be less likely to be closely supervised in their work. At the same time, they would have more opportunities to present good news upwards and suppress or hide bad news. Where there is a lack of organisational (managerial) oversight, the rogue employee is more likely to emerge. Yet, the problem is more than supervision or oversight. The deeper problem is the corporate culture. As Susan Silbey explained a rotten barrel creates a rotten apple. The question that needs to be asked is: “Who creates the rotten barrel?” In most organisations, the senior managers create the corporate culture, which means that when a senior manager becomes a “rogue” employee, the effect is worse for the organisation. As employees will know, a rogue senior employee drains the organisation of energy. 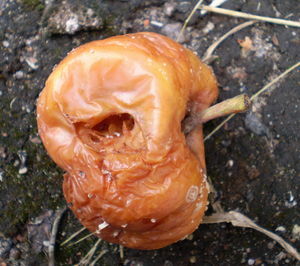 Like a rotten apple, they begin to infect and shape their colleagues. If they succeed, their influence increases at the expensive of the organisation. A case study in this behaviour is Enron, where the top managers set the tone for the company. Other senior managers are unable or unwilling to challenge the “rogue” employees and the corporate culture became rotten. Managing directors perceive the rogue senior manager as good at delivering results. The managing directors rarely look at how those results are achieved. What often happens is that the rogue manager creates a fear or a blame culture and they work to suppress bad news while they report good news. One result of a rogue manager is that staff fail to exercise initiative, for fear of blame, which makes the senior manager appear effective and decisive. In an extreme case, staff will wait to be told what to do. Initiative is drained out as compliance and obedience are rewarded as innovation and challenge are punished or not rewarded. In many cases, a rogue manager is effective in blame avoidance cultures. They make sure that work is over resourced and duplicated to avoid any blame. As a result, they seem to be delivering results. They leverage their appearance for competency and delivery to enhance their reputation. They protect themselves by focusing on their reputation with corporate directors, which is at the expense of their staff. In any setting, they question and challenge reports that suggest fault or bad news. Direct reports will know that good news is expected so they quickly comply. At the same time, other managers will avoid the struggle with such a manager. They look to cooperate. The senior manager will be sensitive to appearances. When something appears to be a failure or dissent, it is immediately punished or addressed. In turn, this enhances their reputation for being decisive and delivering improved performance. Is bureaucratic infighting a sign the barrel is starting to rot? In time, as they manage the appearance of competency and delivery, other managers become unable or unwilling to challenge them. Even though they seem as borderline bullies, they are careful to avoid undue attention. They may develop a reputation but no one sees it who can challenge it. Most importantly, they understand bureaucratic warfare. They undermine other senior managers by bureaucratic means. They challenge on low-level issues or insignificant issues. As a result, a normal manager will wonder why this manager is fighting over paperclips. In time, the normal manager believes that if they give in on the small decisions (paperclips) the other manager will cooperate on the large decisions (budgets or staffing levels). However, what the normal manager does not realize is that in compromising on the small issues, they have made it more difficult to resist the large issues. A variant on this strategy is that the rogue manager will wait until the last minute to suggest changes. If the normal manager does not accept the changes, they appear to be the one who caused the deadline to be missed. In some cases, the rogue manager may simply insist on their way. To back this up, they appeal to the managing directors to undermine the normal managers. The other manager, who wants an easy life, will find it easier to let them have their way than constantly have to explain why they are interfering with a “performer” or someone “who delivers.” In time, the normal manager becomes co-opted in the way that the direct reports have been co-opted. In serious situations, the managing directors will weary of the fight and encourage their direct reports to “work with the manager” or “find a way to accommodate them” because they produce results and are important to the organisation. If you tolerate rogue behaviour are you helping the barrel to rot? When a senior manager is rogue, a number of people will be aware of their behaviour. They exhibit a pattern of behaviour. Colleagues will either suspect or know it is wrong. Yet they will likely shrug their shoulders and say, “Thank goodness I am not working for them.” In some cases, they may say “It is not my problem to fix”. The other senior managers begin to feel that they have no responsibility for their colleagues’ behaviour. They may justify this by the belief that the managing directors condone the behaviour. We can see this in the LIBOR fixing scandal where Barclays staff were fixing the rate to “protect” the company. The barrel is rotten before the senior manager assumes power and position. The rogue manager will have worked within the company so they have been promoted from within. Along the way, they will work diligently, and ruthlessly to remove those who have initiative or were brave enough to challenge them. They reinforce a culture of compliance that existed as they grew up in the organisation. Karl Albrect described the Despotism syndrome in his list of 17 syndromes of organisational dysfunction. In doing this, they were surrounded by a wider corporate culture that likely valued appearances and good news. The concern with appearances then undermines critical upwards communication. In turn, the junior employees will understand that they need to conform and make sure that the good news is being promoted up. The employee understands that their voice is not to be exercised. In some organisations, the managers will discourage internal communication that allows workers to organise or compare their work. In these companies, social media is resisted. In other cases, they may be monitored so heavily for “dissent”, that staff soon refuse or choose not to use them. Instead of internal communication, personal networks emerge. You will find that the organisation does not have a robust system for sharing information and learning, which allows the rogue manager to flourish. Instead of a social media organisation, where employees are able to share their ability, the system becomes command and control. To some, the above may appear a bleak summary of an organisation; to others it may appear exaggerated. In most organisations, the situation never becomes as problematic as described because they have mechanisms in place to prevent them and to contain them should they emerge. For example, they may have a “No assholes rule” or they may pride themselves on good customer culture turned into good customer service. What these firms show is a strong corporate culture that staff and managers understand as they agreed and accepted way of getting things done. If your organisation does not have the following characteristics, it is a good sign that the barrel is becoming rotten. First, the company’s internal communication system allows bad news to be told to senior managers. Second, senior managers will check their corporate culture. They want to support their corporate culture and be concerned that the corporate culture is not being followed. Third, managing directors will reward senior managers for how well they treat their staff as well as by their results. Finally, the managing directors will be interested in the number and types of grievances, disciplinary cases, dismissals. They will check exit interviews to learn about why people are leaving the company. If you have a strong corporate culture, your organisation will want to understand why staff leave and learn from their departure. This entry was posted in change, coruption, culture, leadership, learning organisation, management and tagged Barclays, Business, Employment, Enron, LIBOR, Organization, Organizational culture, rotten apple, Senior management. Bookmark the permalink.